Glendale Bench is a 7,000 foot plateau a few miles east of Zion National Park, bordering the east side of the Virgin River valley, composed of a thick layer of white Navajo sandstone - the same rock seen prominently in the national park, and ringed by steep slickrock slopes of the Elkheart Cliffs. 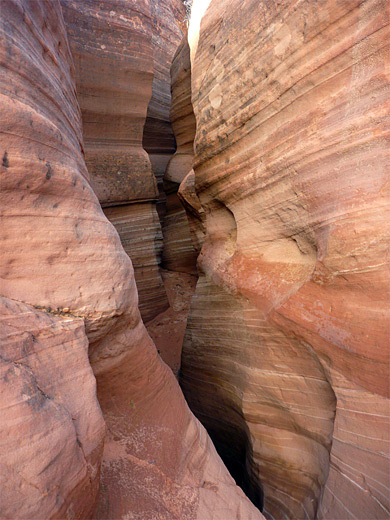 At lower elevations, a thinner, red colored component of the same geological formation extends a mile or so west, ending at a low escarpment and crossed by around a dozen small drainages, some of which have eroded short slot canyons as they cut into the edge of the sandstone. 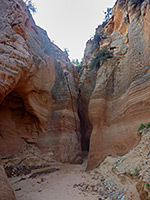 These include Red Hollow, the two forks of Sand Wash and a similar drainage a little way south, and although its narrow passages are short and shallow, this canyon is easily reached, being just off US 89, and can be explored in less than an hour. There is no official name, though some people are calling the ravine Diana's Throne Canyon. A suitable parking area for the canyon is at the start of two sandy tracks that join the northeast side of US 89 between miles 78 and 79, near the top of the climb from the Virgin River valley, and half a mile west of the road to Coral Pink Sand Dunes State Park. 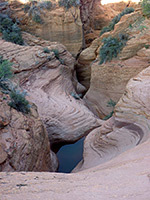 The hiking route is along the track perpendicular to the highway, around a small knoll then cross-country down the steep, sandy slope on the far side, joining the drainage just below the lower end of the slot, where the wash emerges from vertical red cliffs, about 50 feet high, exactly like the lower ends of the two branches of Sand Wash. Upstream, the canyon has a few pretty chambers through stripy rocks, then a dryfall that might be difficult to climb, followed by shallower narrows, another dryfall, a straight passage and more potholes and falls, above which the wash becomes shallow and sandy-floored. All obstacles can be bypassed if necessary, by climbing around on the north side. 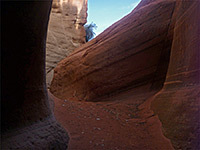 The rocks in the narrows are deep red in color, covered in a few places by bright green moss; also similar to Sand Wash. 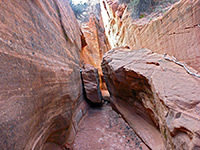 Many footprints in the narrows, and a rope at one bypass point, suggest the canyon is quite well known, and while not so spectacular, it is worthwhile owing to its easy approach.